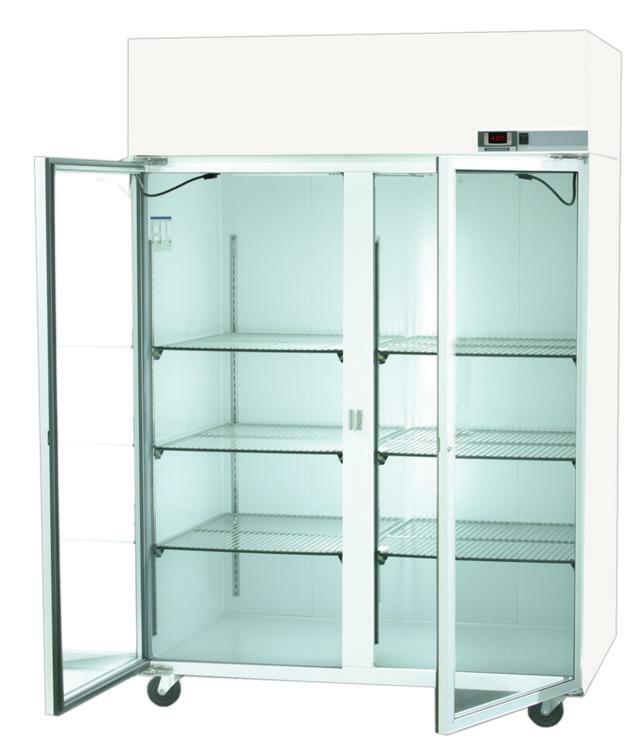 ​Heavy duty top mounted refrigeration systems are best units for space saving, reliable temperature cabinets in the lab or for any use. 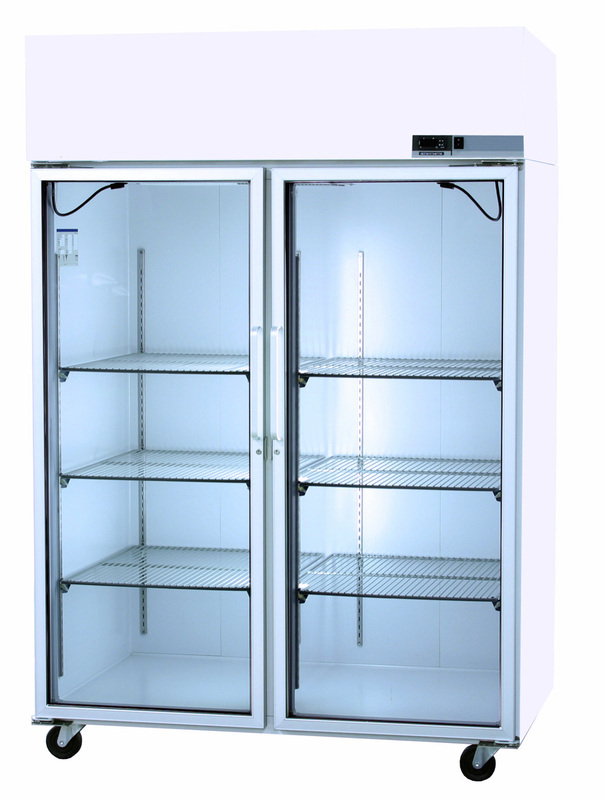 The forced air flow helps uniformity of temperature and is managed by the reliable and easy to use LED microprocessor control, which features adjustable temps from 2 to 10°C. Audible and visual alarms assure you can keep your desired temperature. Galvanized steel, with a rugged and clean coating, combine with the high density polyurethane foam insulation to maintain temperature. The glass-door units feature full size, double pane glass with anti-condensate heating wires to maintain clear views of the interior. Interior lighting is an additional aid to viewing product. 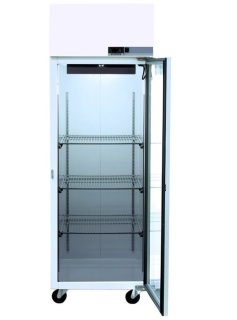 Four casters on one and two door models (2 locking) and six casters (3 locking) on three door model, 3 epoxy coated wire shelves per door section. 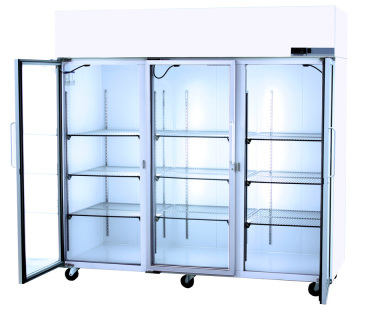 Full size, double pane glass doors with anti-condensate heater wires, interior light, switch activated. 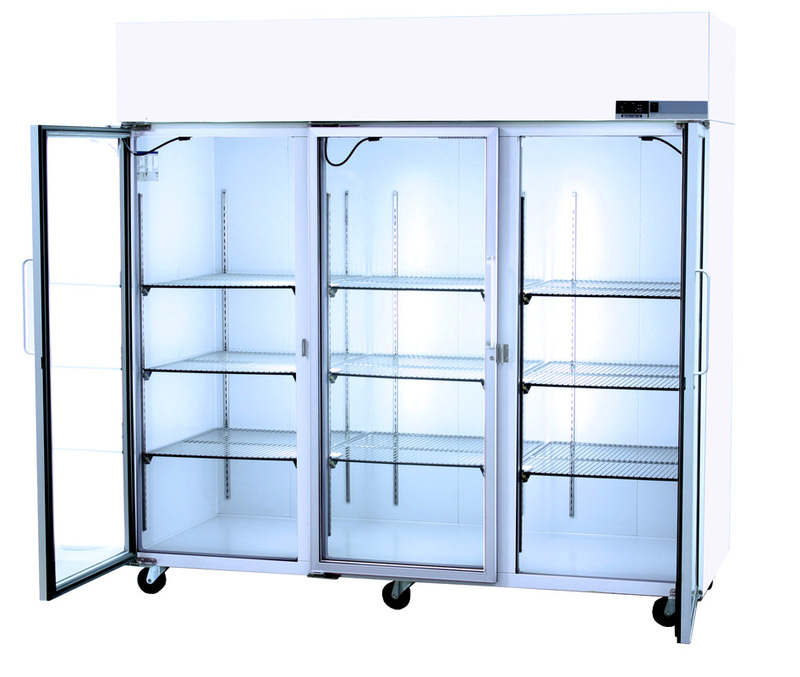 Complete top mounted refrigeration system maximizing storage area, forced air flow refrigeration optimizes air flow and temperature uniformity, automatic condensate evaporation, automatic defrost. Warranties: (US and Canada) 18 months parts and labor. 5 year compressor. 18 months parts (international). UL, C-UL and CE Mark, CEC California Energy Commission. Continuous product temperature display - Product sensor with glycerin bottle - Digital LED microprocessor control with audible and visual Hi/Lo alarm and remote alarm contacts, adjustable control range from 2°C to 10°C factory preset at 4°C. Exterior front, sides and back painted white, exterior top and bottom are galvanized steel, interior is painted white. 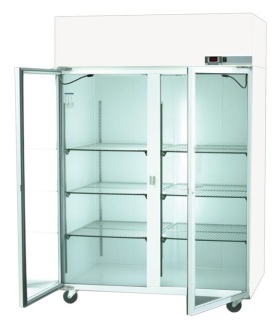 Complete cabinet is foamed-in-place with high density polyurethane foam insulation, with heavy duty glass door(s) with pivot hinges and pull handles and magnetic door gaskets and key door lock(s). 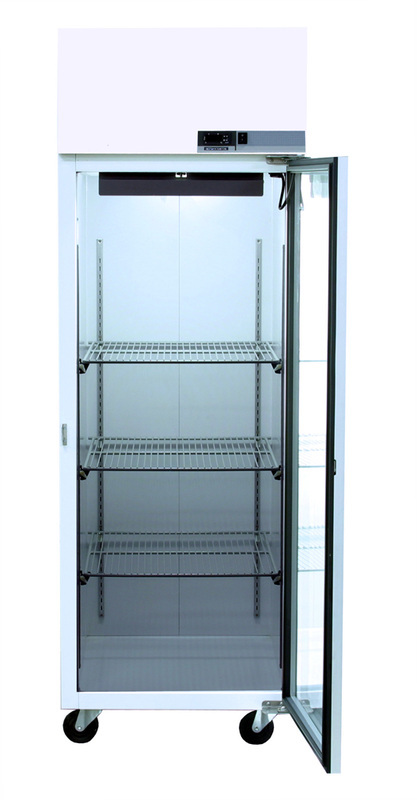 3 shelves behind each door, up to 92 pounds per shelf. 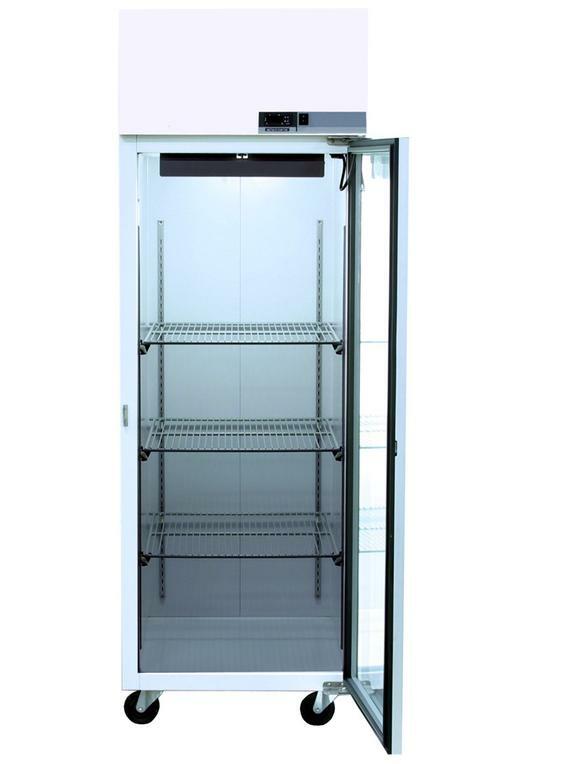 4 shelves behind each door, up to 69 pounds per shelf. WHITE GLOVE SHIPPING INCLUDED - Must be a commercial address in continental US. Warranties: 18 month parts and labor, 5 year compressor. (US and Canada) 18 months parts (International). UL, C-UL, CE, Energy Star, and CEC Commission. See Full Upright Warranty.